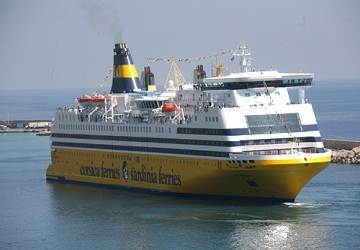 Corsica Ferries flagship Mega Smeralda is 560ft long and can carry up to 2000 passengers and 560 vehicles. Formerly the Color Festival, this ship was purchased from the Norwegian Company Color Line in 2008 and renamed Mega Smeralda. Mega Smeralda is equipped with a selection of restaurants, bars, dedicated children's play areas, video games room, shops, a swimming pool, nightclub/disco, cinema, a selection of cabin accommodation and much more! 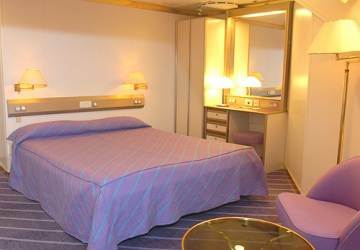 The Mega Smeralda has 539 cabins, both inside and outside (sea view) ranging from standard 2 berth bunk bed cabins to luxurious suites with double beds. All cabins are en-suite. The Mega Smeralda serves Mediterranean and international cuisine across 5 magnificent restaurants, each offering a unique setting with something to suit all tastes and budgets. 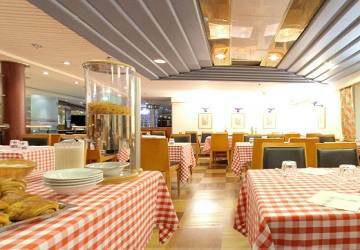 In the spaghetteria/pizzeria you’ll find pasta, pizza, a delicious selection of starters, main courses and desserts. 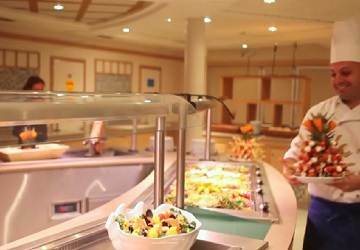 In ‘la Trattoria Riviera’ you’ll find all the flavours of Italy served in an authentic setting. 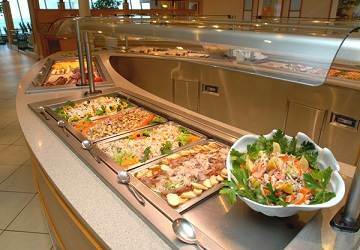 The self-service ‘Buffet Veranda’ offers salads, starters, speciality pasta, meat, fish, a selection designed with children in mind and a large choice of deserts. 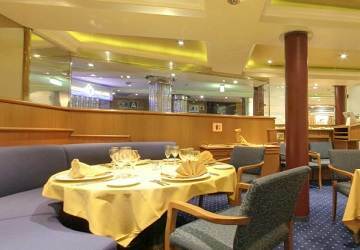 The Captains Grill restaurant is affiliated with the famous ‘Chaîne des Rôtisseurs’ – a guarantee of quality and offers a choice of set menu and a la carte. 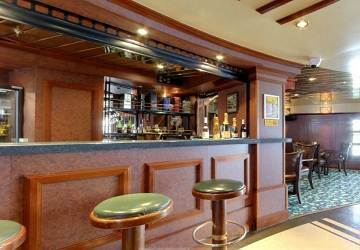 The ship also features 4 bars with varied themes in which to relax in and enjoy. These include the Sailors Pub, the Panorama bar, Bar Smeralda and the outdoor deck bar 'Il Chiosco'. 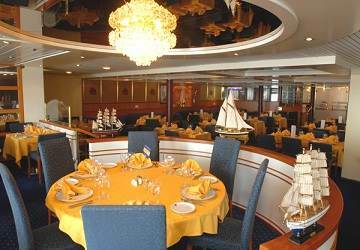 On deck 1 you’ll find the 92 capacity 'Dancing Palace' disco. 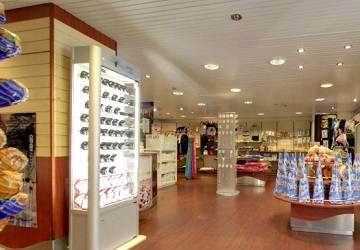 In the onboard shop you’ll find a choice of popular perfumes, cosmetic products, clothes, sweets and more. 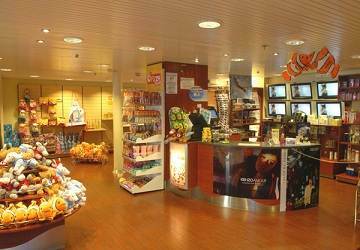 Mega Smeralda has a swimming pool, 2 cinema rooms, and an information/reception desk to assist you during the crossing. 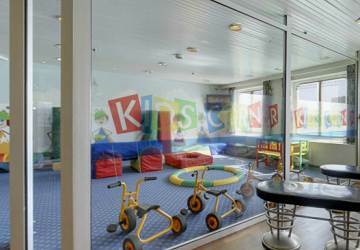 Children are well catered for onboard the Mega Smeralda with their own dedicated play area. There is also a video games room for the older children. Please Note: Whilst we have taken great care in making our Mega Smeralda guide as accurate as possible, onboard facilities, services and entertainment may vary depending on the date and time of year that you travel, facilities mentioned may change without notification and ferry companies reserve the right to operate vessels other than those mentioned at time of booking without prior notification. Did this trip overnight recently, a great experience. Had dinner in the Italian restaurant, great food and good service, couldn't have asked for more.cabin was clean and comfortable, arrived in Toulon on time. Would use this service again, beats flying!! We had a cabin upgrade and it was clean and comfortable. There was plenty of food options and even wifi. Excellent experience! Savona-Bastia. Fast chek-in, we did not even get off the bike, we presented the Direct Ferries printed confirmation and they just put a stamp on.... Perfect organization inside the garage, the bikes were all properly fixed. 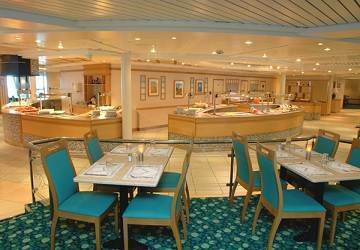 Good cleaning and huge common areas on board. On the return on board the Smeralda Express we tried the italian restaurant, it was really good, what a surprise!!! Next journey will be for sure with Corsica Ferries! 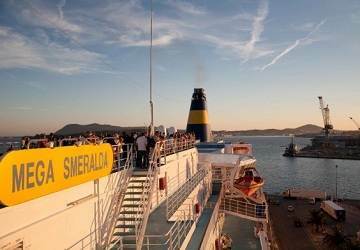 "Mega Smeralda is a nice ferry!" 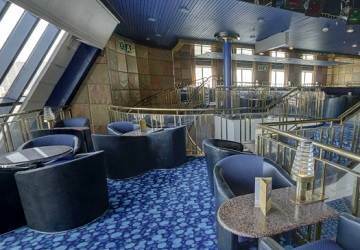 This is a really nice 'old school' ferry with a variety of places to eat and drink, plenty of outside space, very reminiscent of the much lamented Pride of Bilbao that sailed between the UK and Spain for many, many years. Ours was a daytime crossing so didn't get to see any entertainment or sample the cabins but I could imagine a night crossing would be a pleasant experience. The crew are a happy bunch too which adds to the good atmosphere on board. The loading/unloading procedure was perhaps a little frantic and the tying down of motorcycles a little haphazard (I was left to sort out my own as the guys seemed to lose interest after the first few), but all in all, as ferry crossings go, very enjoyable. Nice trip. nice cabins and food. Just noisy neighbors... I would do trip again without hesitation. One fault was in The cafe,it had only one cashier working so food was cold by the time it was paid for as the line was so long. This is quite bad and people were annoyed, so improvement needed here. So I would tell people to take there own snacks & food. The journey from Livorno to Bastia was impeccable. Departure and arrival on time and clean facilities. Highly recommended. The Express 2 was very noisy, it was impossible to sleep (I booked an outside cabin). De mega Esmeralda was way better, even the meals in the Trattoria were excellent. The service on this ship was very good. Am very satisfied! We take the ferry every year and generally it's good, but this year especially was nice cheap price and impeccable service. "A return crossing from Livorno to Bastia with the car"
The outbound journey was certainly nicer, because the Mega Smeralda is more recent and more comfortable. Moreover, the disembarkment was quick and problem free. The inbound journey with Corsica Marina however, the boat was more ancient, people were laying on the floor and the disembarkment was more chaotic. Plus, I thought that the crossing was only lasting for 4 hours, between 2pm and 6.15pm. I don’t understand why you can’t lay down on the numerous deck chairs and sunbathe on the deck or resting inside on the seat with the air conditioning. Who knows? Maybe the staff was more tired or deflated during the inbound journey (translation: not interested in their jobs and rude). Well, you can’t have everything. I will use this company again. The staff is pleasant and you are not harassed to buy drinks (we were at the paronamic bar). We were able to appreciate the view without any problem. They were able to answer our questions and to give us directions. The place is clean, we departed on time. I must admit that parking the car is a bit challenging. Overall, we are satisfied with both crossings. 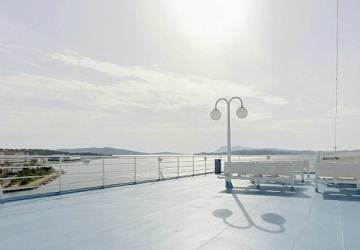 "Livornio - Bastia - Livornio"
Both crossings went well, the only thing lacking are deck chairs aboard the Mega Smeralda. We enjoyed laying on the deck chairs during the 4 hours of the crossing aboard the Corsica Marina. I confirm that I will use your company Corsica again. I have nothing bad to say about you. It's well organised and friendly.